Installation is easy, all you need is a screwdriver and a little time. The set is designed to fit standard prep doors and most installations should take less than an hour. BHMA/ANSI Grade 2 certified which indicates excellent performance across a range of residential applications. This product is built from high-quality materials to give you exceptional security. Passage Function: Schlage's passage door knob sets have no locking function and are free turning on both sides. These knobs are perfect for a hallway or closet where a lock isn't necessary. 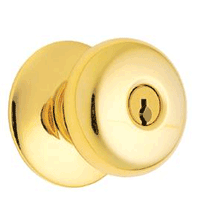 Passage knobs can also be used in conjunction with a deadbolt to secure an entrance or back door. Series 4000 Grd 1, UL Listed for 3-hour fire door.